The relationship between land and nobility in Hungary developed in a unique way. In Western Europe, feudalism demarcated a very specific autonomy of land; lands and domains were parcelled out, to various vassals. In time, the particular domains (or estates) assumed a symbolic significance and their owners were often seen as merely representatives of the estates. This is one of the origins, for instance, of the fact that in the United Kingdom only one individual can hold a particular noble title. Hungary never had authentic feudalism: all nobles were legally the same distance away from the king. More importantly, it seems that the ancient nomadic ways of the Magyar nobles made land relatively unimportant to them. Only with the early Arpads did the dividing of the kingdom begin. However, the Hungarian laws of inheritance (which again seems a relic of the nomadic way of life) insisted on dividing a man’s possessions equally amongst all his children. A Hungarian noble, then, upon death, had his estate fragmented. Indeed, the earliest documents we have of noble families, from the 13th and 14th centuries, for the most part describe conflicts and family feuds over inheritance. The breaking-up of Hungary, then, begun as early as the 13th century. The process continued largely unabated until the 20th century, ruining the nobility with the weight of bureaucracy and administration. Many of the families discussed in this blog came from a small number of villages – but the misconception seems that these families only owned property in those villages (or the places which formed a part of their noble predicate). Families chose to live near each other in communities – but their properties (of land) were scattered throughout the region. This scattering of small estates (one should say plots of land) is due to the centuries-old process of the fragmentation of estates; inheritance, gift, mortgage, purchases and sales. The Doka of Reca was good example of this. It is lucky that the Bratislava archives hold the Doka family archive, as one of the very few noble archives there. It contains a wealth of materials, mostly concerned with running their scattered estates over the whole of Bratislava county, though they lived chiefly in Reca. The Doka’s are slightly exceptional because they appeared to have managed to become rather wealthy. And though they could never pretend to be of the upper nobility (or ‘aristocracy’, reserved for the few barons and counts raised by the Habsburgs), they were an example of that wealthy and powerful noble family which formed the backbone of the Hungarian countryside. The basis of the Doka’s landholdings was the village of Tomasikovo, in the Galanta district near Trnava. This was the possession of Stephen Doka in the 17th century. With his marriage to Anna Foldes he gained the domain of Kosse (a now lost locality in the region). The family conducted many feuds over this land with the locally dominant Esterhazy family. The man who really changed the family’s fortunes was Michael Doka, living at the end of the 18th and first half of the 19th centuries. His two marriages, lucrative county posts and intelligent purchases of property he added to the family landholdings portions of Reca, Csataj, Opoj, Dudvah, Bustelek, Horne Janiky, Puste Ulany (Puszta Fodemes), Jelka (Joka), as well as the domains of Borsaiz and Csandal. This became the very respectable estates from which all the subsequent generations of the Doka profited. Michael’s son, Ladislaus (Laszlo), managed to increase the size of the Reca estates by adding to it those of the extinct (and ancient) Bornemisza lands. 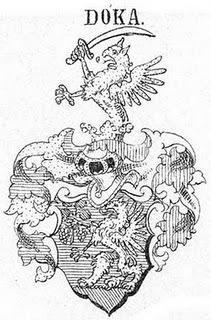 When he in turn died, his son (also Ladislaus), added his wife’s inherited landholding portions of Cierny Brod (Vizkeleth) and Sasa, as well as a house and lands in Trnava (Nagyszombat). After the collapse of Austria-Hungary and the creation of Czechoslovakia, the state confiscated the Doka’s Reca estate, because in terms of size it qualified as a ‘velkostatok’ - that is, a large estate usually owned by the aristocracy. This was in large part due to the fact that the Doka's actually leased much of their Reca lands from the compossesors - that is, the other noble landowners. In theory the Dokas were 'tenant farmers', though in effect they were noble landowners. However, the estate was returned in 1925, only to be confiscated once and for all after World War II. The archive introduction states that the Doka family became extinct in the 1960’s – with the archive passing into state hands. The Doka archives are rich in detail – many archies of gentry families were so, simply because of the need for land deeds and evidences of legal processes relating to property. But this post is to show just how complicated and twisted property in Hungary became, even for noble families which were very well off. Perhaps to cut the Gordian knot was a right thing. On the other hand, Slovaks have learnt nothing – their inheritance laws are still stubbornly based on Hungarian noble common law (as probably the only aspect of their ‘civil code’): forced inheritance. As AJP Taylor wrote, "the Hungarian gentry lived aloof and remote in their counties; few of them entered royal service; they tended to regard the Habsburg King as a foreigner, often as an enemy". This is one reason why the history of the Hungarian nobility is so obscure and little-known today. This blog will attempt to illuminate the life of the Hungarian gentry from one County, the County of Bratislava - a county of very particular significance, being one the oldest counties; being so near to Vienna; having been the county of the Hungarian capital, and being one of the Slovak capital today; and having such a diverse historical nobility.